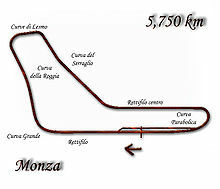 The 1968 Italian Grand Prix was a Formula One motor race held at the Monza Autodrome on September 8, 1968. It was race 9 of 12 in both the 1968 World Championship of Drivers and the 1968 International Cup for Formula One Manufacturers. The 68-lap race was won by McLaren driver Denny Hulme after he started from seventh position. Johnny Servoz-Gavin finished second for the Matra team and Ferrari driver Jacky Ickx came in third. There was a five-week break after the previous Grand Prix in Germany, and before F1 circus resumed in Italy. The season so far had seen both rainfall and tragedy. During the break, the Oulton Park Gold Cup attracted some of the top names, with Jackie Stewart taking the victory, after his dominant victory at the Nürburgring. The early qualifying session saw Andretti and Unser set the pace, recording fast time, especially as both drivers wanted to fly back to the US for the Hoosier Hundred at the Indiana State Fairgrounds (a 160km dirt track race), on the following day. They then intended to fly back to Milan and race in the Grand Prix. The event organisers announced that if the either driver returned to the States and race, they would be banned from competing in the Grand Prix, under an ACI ruling which forbade drivers to complete in another event within 24 hours of the start of the Grand Prix. Both Andretti and Unser flew back to Indiana for the Hoosier Hundred and did not return. Qualifying resulted in John Surtees taking pole for the Honda Racing team, in their Honda RA301, averaging a speed of 150.314 mph. He was joined on the front row by Bruce McLaren in his own McLaren M7A and Chris Amon in a Ferrari 312. The second row saw the Ferrari of Jacky Ickx and the Lotus of Graham Hill. Jackie Stewart, Denny Hulme and Derek Bell shared the third row. The race was held over 68 laps of the Autodromo Nazionale Monza, taking place in sunny conditions, with John Surtees leading straight from the start. By the end of first lap, Bruce McLaren was ahead. McLaren stayed in front until Surtees slipstreamed back into the lead. The following lap McLaren was ahead again, while the leading Ferrari of Chris Amon lost control on oil dropped by one of the Honda RA301s and his car flew over the barriers into the trees at one of the fast Lesmo corners. Surtees also hit the wall trying to avoid the Ferrari. This put Jo Siffert into second place, with Jackie Stewart third. The Scotsman moved into second and a slipstreaming battle developed for the lead between McLaren, Stewart, Siffert and Denny Hulme. McLaren's M7A had to stop for more oil on lap 35 and retired. Stewart disappeared on lap 43, when his Cosworth engine failed. Hulme was by this stage already leading the race, and when Siffert went out with a rear suspension failure, nine laps from the end, Hulme was left to win. He won in a time of 1hr 40:14.8mins., averaging a speed of 146.284mph. There had been a lively battle behind him, between Johnny Servoz-Gavin, Jacky Ickx and Jochen Rindt. The Ferrari of Ickx had emerged ahead, only to stop in the closing lap for more fuel. In the process, he dropped to third behind Servoz-Gavin, while Rindt had to retire with an engine failure. Piers Courage, Jean-Pierre Beltoise, and Jo Bonnier rounded out the top six, with no other finishers. ^ a b c d e f g "Grand Prix results: Italian GP, 1968". grandprix.com. Retrieved 26 September 2015. ^ a b c "1968 Italian GP". ChicaneF1.com. Retrieved 2014-03-04. ^ a b "1968 Italian Grand Prix". formula1.com. Archived from the original on 12 November 2014. Retrieved 26 September 2015. ^ "Formula One, Italian 1968 Race Results". crash.net. Retrieved 26 September 2015. ^ a b "Italy 1968 - Championship • STATS F1". www.statsf1.com. Retrieved 1 March 2019. Lang, Mike (1982). Grand Prix! Vol 2. Haynes Publishing Group. pp. 76–77. ISBN 0-85429-321-3. This page was last edited on 18 March 2019, at 16:25 (UTC).